Welcome to Keep Moving Forward! This website is focused towards the audience of band directors, teachers, and educators, but everyone is welcome to enjoy the resources we offer. Share the music! The main goal of our website is to make the sheet music for Keep Moving Forward available for free to high school and community band directors. Keep Moving Forward is a music composition writted by Mark Miller in honor of Sam Berns. You may download the sheet music here. UPDATE: More Music Honoring Sam! Donny Albo has composed a percussion piece for drum emsemble honoring Sam Berns called Burning Bright. The sheet music for Burning Bright is also available for free for band directors. You may download the sheet music here. You can learn more about Burning Bright and listen to a performance by clicking here: About Burning Bright. Teach our children. Secondary goals of this website are to increase awareness about Progeria, allow visitors to get to know Sam Berns, and provide the materials you need as a teacher to support an educational program or event for your school. We hope you enjoy the music of Keep Moving Forward by Mark Miller, and we wish you success with your educational program about Progeria. Download the sheet music and score for Keep Moving Forward - it's available for your band for free on this website. Keep Moving Forward is a fun and interesting piece for to perform all by itself. Of course, if you get to know Sam Berns, your students will appreciate a much deeper meaning of the arrangement and performance structure. You may also download Burning Bright, a percussion piece composed by Donny Albo in memory of Sam Berns. The Get To Know Sam Berns section of this website offers your students the chance to meet Sam Berns, hear his inspiring message and philosophy for a happy life, and learn more about Progeria and our search for the cure. Perfect for the classroom as a primer for Progeria education for simple awareness, inspiration for musicians, or even detailed scientific discussion. The For Educators section of the website offers educational material and links to resources that can be used to build a Progeria educational curriculum for your classroom. Coupled with the Sam Berns videos and a performance of Keep Moving Forward, this is a unique opportunity to present an engaging and memorable learning experience or event for your students and community. All of the material and information on this website are provided free of charge and with the hopes that they will enrich the education of your students. We encourage educators who use this material to leverage music and educational events to help us find a cure for Progeria. 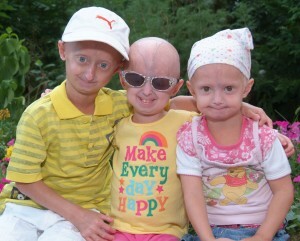 Consider a Progeria fundraiser at your school to benefit the Progeria Research Foundation.